This activity is related to a Teachable Moment from Aug. 29, 2017. See "The Farthest Operating Spacecraft, Voyagers 1 and 2, Still Exploring 40 Years Later." Students will model the mathematics used to communicate with spacecraft. They will use sound waves as an analog for light waves and parabolic transmitters and receivers to represent antennas on spacecraft and on Earth. For parabolic dish ear antennas, make copies of the antenna pattern on cardstock and collect recycled 1- to 3-liter soda bottles (one per student). Locate an open area at least 120 meters in length, such as a football or soccer field. Standard football field yard-line markings may be used for measurement in lieu of measuring tape or a trundle wheel. Download a metronome app for your mobile device and program it to beep once every second. Although any mobile device will work for this activity, smaller devices such as mobile phones may be easier to hold in place on the shaft of the umbrella. Note that the best amplification will occur when the speaker of the mobile device is at the focal point of the umbrella. NASA has been sending robotic spacecraft into the solar system for more than five decades. These mechanical explorers have ventured out to study Mercury, Venus, Mars, Jupiter, Saturn, Uranus, Neptune and beyond. These amazing robots have also been our eyes and ears on their journeys to far-off planets and even to the edge of the solar system, sending wondrous images and fascinating information back to Earth. 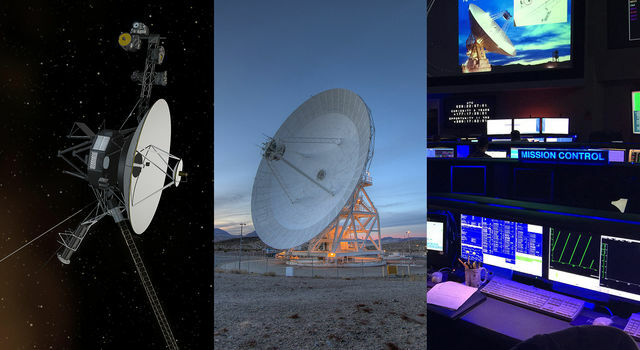 But none of these missions of discovery would have been possible without NASA’s Deep Space Network, or DSN — a worldwide system of sensitive antennas that communicates with interplanetary spacecraft. Signals to and from the spacecraft travel millions, even billions, of kilometers, yet spacecraft communications technology transmits signals at very low power, usually at about the same wattage as a refrigerator light bulb (20 watts). As the signal travels to Earth, it weakens. Signals arriving at DSN antennas on Earth can be as weak as a billionth of a billionth of a watt — that is 20 billion times less than the power required for a digital wristwatch. How is it possible to hear the tiny whisper of a signal from a spacecraft so far away? 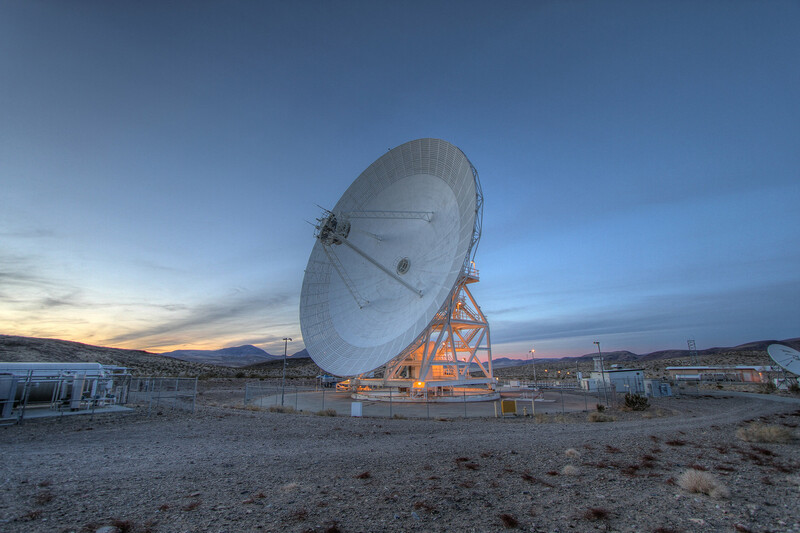 The Deep Space Network is made up of complexes of antennas at three locations around the globe: Goldstone, California (in the Mojave Desert); near Canberra, Australia; and near Madrid, Spain. This arrangement allows for any one station to have a line of sight to a spacecraft as Earth rotates. When a spacecraft “sets” below the horizon as viewed from one antenna station (like the sun does at the end of each day) another antenna station can track the spacecraft as it rises above the horizon at that location. 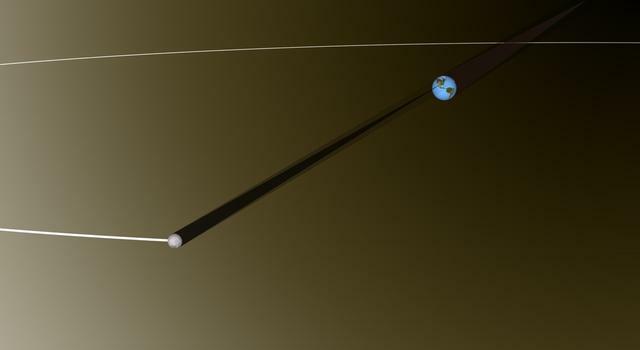 This repeats as Earth rotates and the spacecraft moves out of view of the second station and into view of the third, and then once again to the first station. To hear the low-power spacecraft signal, receiving antennas on Earth must be very large, with extremely sensitive receivers. The signal from the spacecraft travels in a straight line, and it can be focused by a curved reflector dish (parabolic antenna). For this reason, it’s crucial to have large antenna dishes with precisely shaped surfaces. The Deep Space Network’s parabolic dishes, which range from 26 to 70 meters in diameter, are focusing mechanisms that concentrate power when receiving data and also when transmitting commands. 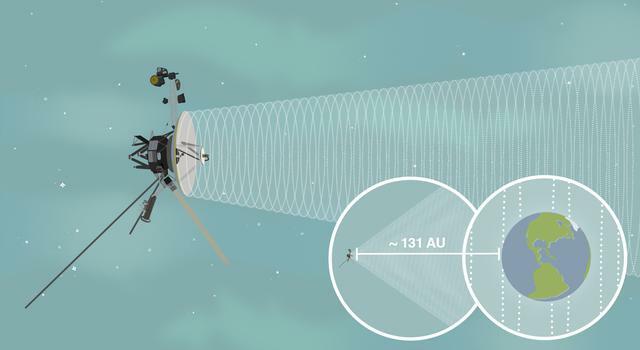 The antennas must point very accurately toward the spacecraft, because an antenna can “see” only a tiny portion of the sky (as though it's looking at the sky through a soda straw). To hear the spacecraft’s faint signal, the antennas are equipped with amplifiers, but there are two problems. First, the signal becomes degraded by background radio noise (static) emitted naturally by nearly all objects in the universe, including the Sun and Earth. The background noise gets amplified along with the signal. Second, the powerful electronic equipment amplifying the signal adds noise of its own. The Deep Space Network uses highly sophisticated technology, including cooling the amplifiers to a few degrees above absolute zero, and special coding techniques so the receiving system can distinguish the signal from the unwanted noise. New space missions bring new challenges. NASA’s Deep Space Network is continually improved and enhanced to provide communications, navigation and tracking for distant spacecraft — our robotic explorers of the cosmos. Use DSN Now to see which spacecraft we are communicating with at this very moment. Start the metronome app and ask students to gather around to listen to the sound of the metronome beeping at one-second intervals. (The sound of the metronome represents a communication signal sent from NASA scientists on Earth to the spacecraft or a signal sent from the spacecraft to Earth. Explain to students that spacecraft use light to communicate and we are using sound as an analog to light.) Ask the students to predict a distance, in meters, they think they can walk away from the source of the beeping and still hear it with their ears alone. Have the students write their predictions in their data tables. Have students develop a hypothesis about how they think using a parabolic antenna will affect their ability to hear the signal the farther away they walk and why. Have students form a circle around the sender (teacher or a student) who is the transmitter or spacecraft sending a signal with the metronome. Tell the students to raise one hand if they hear the signal. The sender should turn, holding the mobile device near their body, pointing the signal in the direction of each student, to make sure all students can hear the beep at a close distance. Ask: Why would the direction the sender is facing change the strength of the signal that each student receives? Tell the students to step approximately one meter farther away from the sender each time they hear the signal, until they reach a distance at which the signal is too weak to hear. Record this distance in the data table. Repeat the experiment three times. Students should calculate their average distance for the three trials and compare data. Ask: Why might there be variation in the point at which different students lose the signal? Have the sender hold the mobile device next to the umbrella handle, sliding the device along the shaft to locate the focal point of the umbrella as determined by volume of the signal. Tape the device in place to maintain its position. Repeat the activity as before. The sender should turn as before. Repeat three times, record greatest distances, and compute averages. Return to the classroom and have students construct “ear” antennas – cardstock antennas from the patterns provided or antennas made from plastic soda bottles as shown on the ear antenna instruction page. Return to the field, and have students stand side-by-side in groups of four across the field, directing their ear antennas toward the sender with the beeping mobile device and umbrella antenna. The sender should aim the umbrella handle at each student, keeping the mobile device in the same position as before by taping it to the shaft. Students should hold their antennas next to their ears and move farther away from the signal each time they hear it. Repeat the experiment three times and ask the students to record the greatest distance for each test in their data tables. Have students calculate their average distances for the three trials. Have students create a scatter plot model of their data from the three averages. Compare and discuss the observations and the distance data recorded with and without antennas. Create a mathematical model using class data: Create a scatter plot using each student's average of three trials for each scenario (no umbrella, with umbrella, and with umbrella and ear antenna). Note data trends. Ask older students to discern if the trend is linear, quadratic, or other. Ask: How do the antennas increase the distance that the signal can be heard? What mathematical properties are utilized to create amplification? 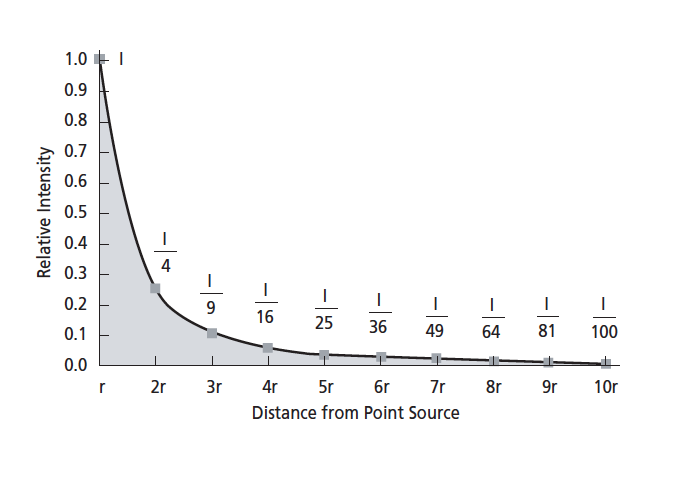 Discuss the inverse-square law and how it might apply to the data collected. The inverse-square law applies to both electromagnetic waves and sound waves. Antennas (radio telescopes) on Earth and spacecraft emit electromagnetic waves; a beeping mobile device emits sound waves. The beeping device in the procedure described here is similar to the emitting antenna or spacecraft; the person listening is the receiver, similar to the receiving spacecraft or antenna. When the distance between the beeping device and the listener increases, the volume of the sound decreases by the square of the increased distance. If the volume of the sound at distance r is I, the volume at distance 2r is I/4r2, the volume at distance 3r is I/9r2, and so on. 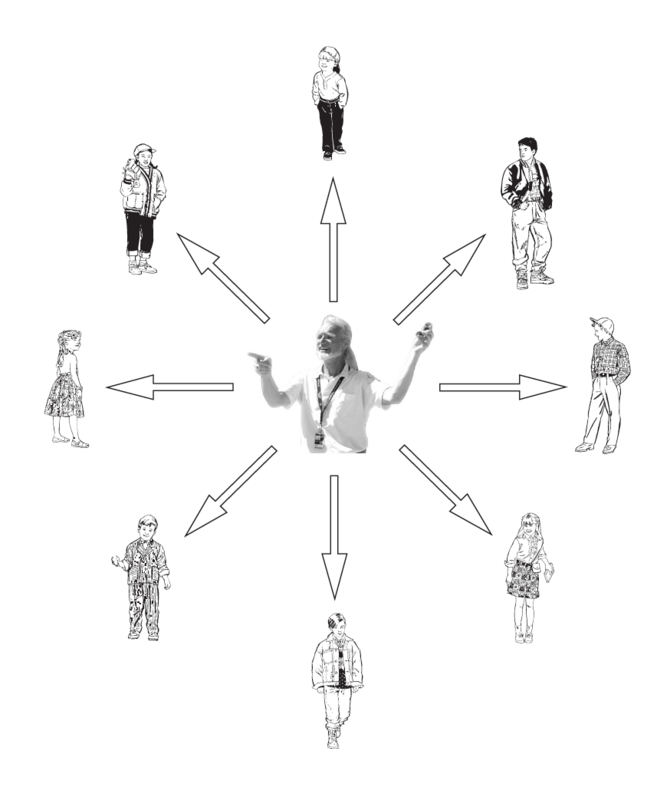 Diagram courtesy of HyperPhysics ©C.R. Nave,2002, Georgia State University. Used with permission.HyperPhysics is at http://www.phy-astr.gsu.edu. Introduce students to the logarithmic scale of decibels. The volume, or intensity, of sound waves can be measured in watts per square meter. 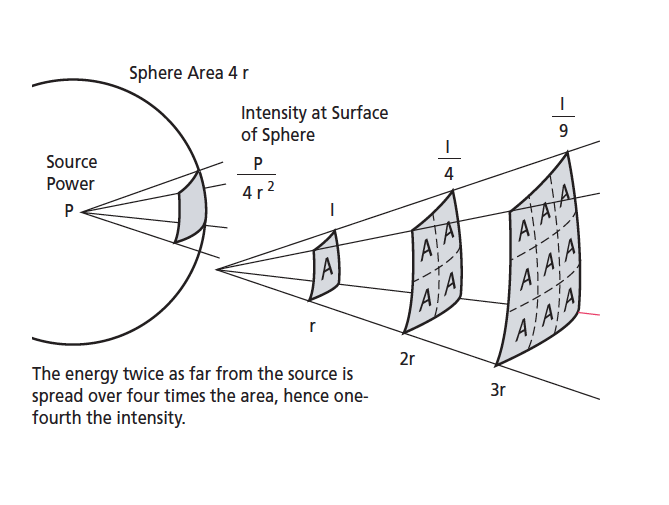 The inverse square law can be used easily with these units. However, the preferred units for volume intensity are decibels (abbreviated dB). Decibels do not easily follow the inverse square law because they are logarithmic — every increase by 10 decibels is an increase in sound of 10 times. This means that 10 decibels are 10 times greater than 0 decibels, 20 decibels are 10 times greater than 10 decibels, 30 decibels are 10 times greater than 20 decibels, and so on. Observe student ability to follow instructions for recording data and creating ear antennas. Examine student scatter plots. Data should roughly follow a quadratic model. Does the size of the antenna/umbrella make a difference? Have students work in groups of four using two additional sizes of umbrellas, a beeping mobile device, and student-made antennas. Students take turns being the Sender (phone/umbrella holder), Listener, Measurer, and Recorder. The Sender holds the phone at a fixed height and position as the Listener steps away from the beeping signal until they cannot hear it while using their ear antenna. The Measurer measures the diameter of the antennas they are using and the distance between the two students (Sender and Listener). The Recorder writes down the measurements in the data tables. Repeat the experiment using umbrellas of two different sizes. Try sending the signal from both the umbrella antenna (the Deep Space Network) and the student-made antenna (the spacecraft antenna). The students record and compare differences they observe related to the size of the antennas, then analyze their data to see if there is a correlation between the antenna’s diameter and the distance between the Sender (phone/umbrella holder) and the Listener. Discuss the results and conclusions of each groups’ experiment. Have students determine the equation that defines the umbrella's parabolic shape. Hint: measure the focal distance from the umbrella's apex to the mobile device's speaker when greatest amplification is achieved. Have students calculate the percentage of the Voyager spacecraft’s signal that is received by Earth with this problem involving the mathematical constant pi.